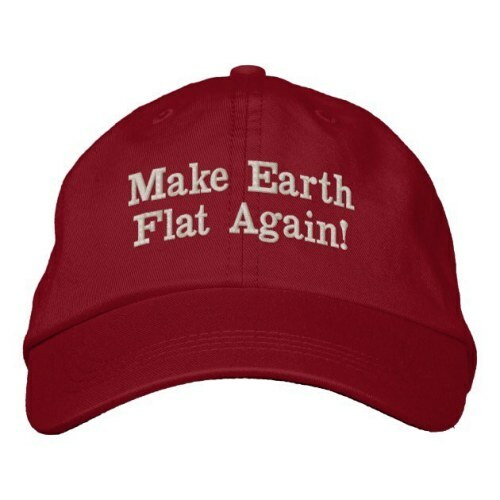 All of you who have been pestering me for a “Make Earth Flat Again!” #Trump #hat, here it is! If you believe “evolution is just a theory” as does former Trump EPA administrator Scott Pruitt, then this hat is for you. If you think, as does our glorious President Trump, that man-made #climatechange is a #hoax invented by the Chinese to steal American #manufacturing, then wear this hat proudly. Fake News is nothing compared to Fake Science! Let the world know what you think – all funds used to send #HillaryClinton and #BarackObama, the founders of ISIS, to #Guantanamo where appropriate interrogation methods will be used to uncover the underground #pedophilia ring they run. Available in my Zazzle store!